Cliches about Colorado weather are often proven true during the winter months. Sunday is no exception across the state. In Pitkin and Garfield counties, the National Weather Service has issued a flood advisory that is expected to be in effect until 9:30 a.m. Potential for ice jams along the Roaring Fork River from Snowmass Canyon to Carbondale could create dangerous conditions along the river. Though it should remain within its banks, flows could increase, bringing ice and debris. 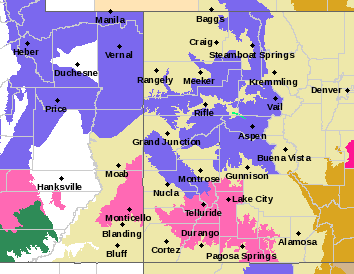 Elsewhere in western Colorado, winter weather advisories and winter storm warnings are in effect. The winter weather advisory covers large portions of the state from west central Colorado to the Wyoming border until 6:00 p.m. Areas above 8,000 feet could see up to a foot of snow and wind gusting to 50 miles per hour. Further south, the winter storm warning also runs to 6:00 p.m. The San Juan mountains may see up to 16 inches of new snow and wind gusts to 55 mph. In the eastern half of Colorado, warm, dry and windy condition will prevail. South central counties will continue to be under a high wind warning until 8:00 p.m. Sunday as a strong jet stream brings the potential for damaging wind gusts. Wind out of the southwest will be in the 35 to 45 mph range, with gusts to 65 mph possible at lower elevations. In mountain areas, 80 mph gusts are possible. 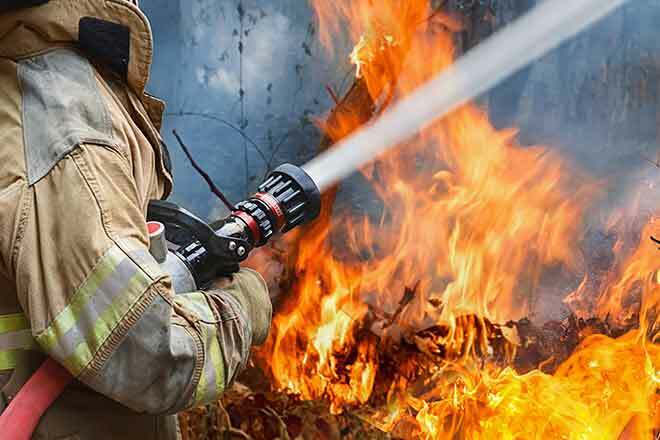 It may only be early February, however fire danger is also appearing in parts of the state. 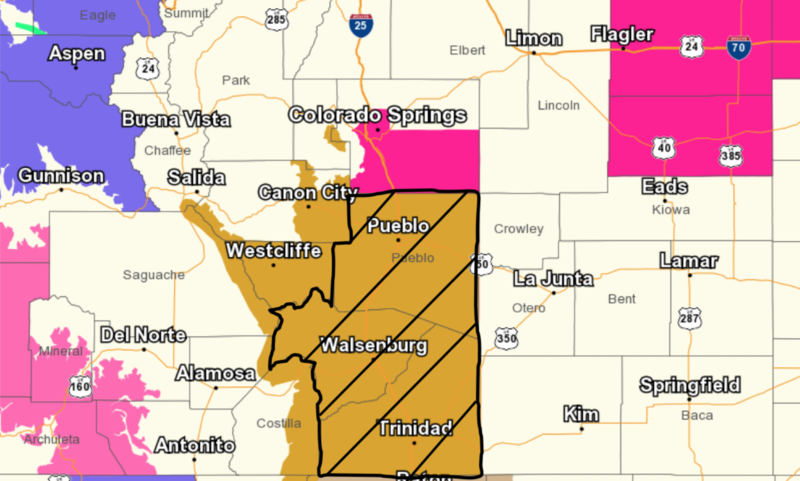 A red flag warning is in effect until 6:00 p.m. for southern El Paso County, all of Pueblo and Huerfano counties, as well as western Las Animas County. West winds could gust as high as 70 mph as humidity falls to around 13 percent. Temperatures are expected to range from the low 60 to low 70s. Drought conditions plague the area. In northeast Colorado, a similar red flag warning will be in place until 6:00 p.m. All of Yuma, Kit Carson and Cheyenne counties are covered. Southwest winds could gust to 40 mph while humidity sinks to 17 percent. The warning extends to neighboring Kansas counties. Outdoor burning is strongly discouraged in all warned areas.